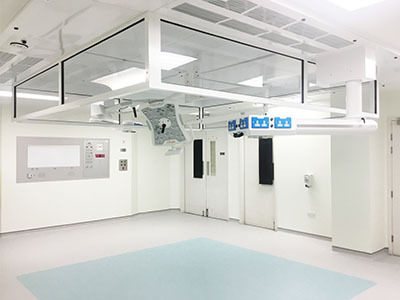 Medical Air Technology (MAT) recently completed the total refurbishment of four ultraclean operating theatres at Sheffield's Royal Hallamshire Hospital, working with Kier and NG Bailey. 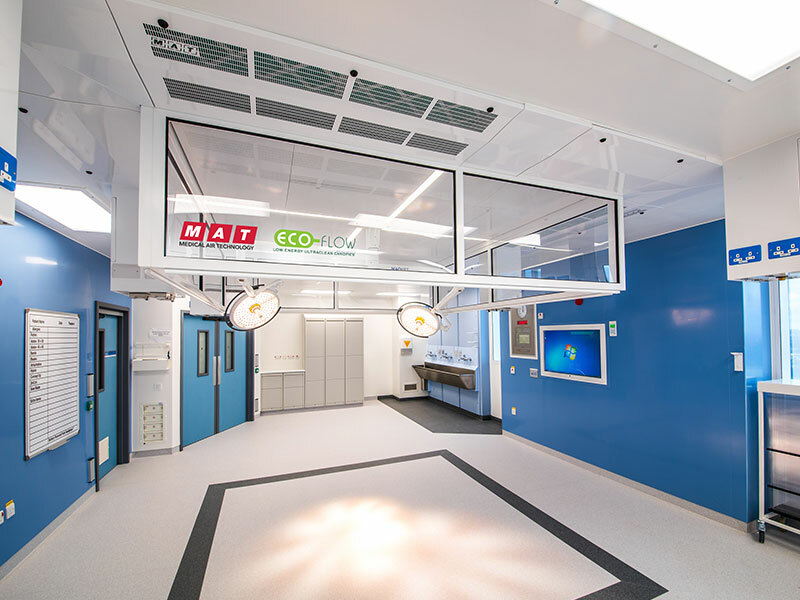 MAT was specified for the project by Sheffield Teaching Hospitals NHS Foundation Trust, having worked at Royal Hallamshire successfully a few years previously delivering the total turnkey refurbishment of theatres three and four. For this project, MAT supplied a specialist equipment package solution, equipping each theatre with an ECO-flow ultraclean (UCV) ventilation canopy, theatre control panel and body exhaust system, the inclusion of the latest technology and design features bringing the theatres up to the very highest standard. The project was delivered on time, within budget and with minimum disruption to the day-to-day running of the hospital, even when all equipment had to be delivered to floor Q, 18 storeys up. Thanks to close liaison between the hospital, main contractor and MAT and a carefully planned programme of work, the project ran smoothly from start to finish. The theatres are now in use, giving the clinical teams the perfect arena in which to deliver world-class care and treatment, with the UCV system dramatically reducing the risk of post-operative infection. The UCV canopies MAT installed are from its unique ECO-flow range, engineered to significantly reduce energy usage and cost, without any reduction in the level of performance. The system uses up to 60% less power than other similar canopies, even in full ultraclean mode. Energy efficiency is achieved through innovative internal design and the introduction of infinitely variable-speed DC motors, while highly efficient centrifugal fans reduce the energy drain required for cooling. The introduction of LED cruciform lighting also improves energy efficiency. The new user-friendly canopies offer larger clean zones and are exceptionally quiet, enhancing the operating experience for clinical staff. The surgeons' panels provide a central focus within the clean zone for infrastructure controls and the alarms and information required in an operating theatre, allowing everything to be controlled and monitored from one central point. The MAT body exhaust system chosen by Royal Hallamshire Hospital offers another layer of protection for patients and users. Tests have indicated that when used in conjunction with the MAT ECO-flow UCV canopy, the number of Bacteria Carrying Particles or Colony Forming Units can be significantly reduced. Most airborne bacteria-carrying particles are of human origin. A person releases approx. 10 million particles/day, equal to 10000 particles/min when moving and approx. 5-10% of these particles may carry bacteria. Bacterial shedding, wound contamination and clinical infection rates in clean wounds are influenced by operating theatre dress. Bacteria are dispersed on epithelial cells that break into smaller fragments of approximately 5-60 µm; these can pass through the interstices of standard cotton fabric, which has a pore size of 80-100 µm and become additional bioburden that would need to be dealt with by the UCV canopy operation. To help reduce the bioburden in the operating room, the surgeon wears a Ventile walk-in gown and an exhaust "necklace" of flexible lightweight tubing with several holes, secured with ties at the waist. Air local to the surgeon and any associated shed epithelial cells are extracted via the necklace and flexible tube, which is connected to an outlet on a pendant mounted integrally to the UCV canopy. A dedicated body exhaust fan unit is installed in the plant room to expel this air to atmosphere. MAT offers a wide breadth of services so is able to respond flexibly and quickly to the specific needs of each client, providing all the benefits that come from working with a specialist contractor. 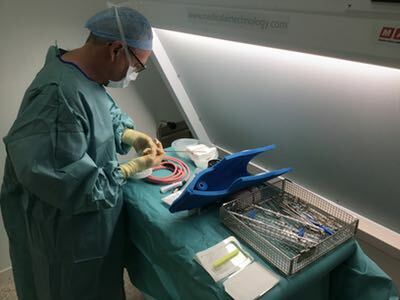 With its own in-house manufacturing facility and dedicated team of highly skilled engineers, MAT manufactures and supplies bespoke equipment for demanding clinical arenas. Clients can choose from several options, ranging from UCV canopy only right through to a total turnkey package, ensuring they get exactly the solution they need. In addition, MAT FM can provide a range of competitively priced and highly effective service and maintenance packages for all core products and turnkey solutions offered by MAT or other suppliers, ensuring that equipment is maintained, serviced and validated correctly for optimum performance.